I finally decided to break up my Sanderson streak (The past nine books I read…) and finish up The Hitchhiker’s Guide to the Galaxy series. It’s nice to change things up a bit. The Restuarant at the End of the Universe continues where we left off at the first book with all of the same characters. I interpreted the title of the book as a restaurant at the edge of the Universe not the end, so that was a surprise when I got to that part. This series is wildly popular and stands the test of time for good reason. 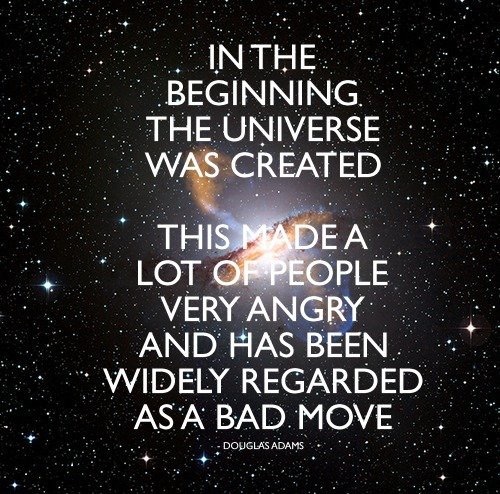 The humor that Douglas Adams puts into his works is nothing less than entertaining. I found myself smiling most of the time I was reading this book and even sometimes exhaling through my nose. It can feel like such a relief to change up your reading with something as light as this. It took me no time at all to get through the rest of this series. If you haven’t read past The Hitchhiker’s Guide to the Galaxy, or if you have only watched the movie, I highly recommend continuing with the whole series. I need to go back and re-read too, I had forgotten how much I love these books. The one problem is that if I read too much DA, I start writing like him! It’s a truly fantastic read. For anyone who has studies the philosophy of time there are a lot of fun bits Douglas works in. Hadn’t given The Hitchhiker’s Guide but keep hearing about it… If it’s anything like Jasper Fforde or Terry Pratchett think it’ll be right up the alley 🙂 Thanks for the review! I got totally hooked some years ago and laughed myself through the whole “trilogy”. Great books and good post. Have you completed reading the whole series? I’ve only read the first 3. I need to finish the rest! Marvin is amazing! I rarely find books I straight up laugh out loud at, but I did with these two! 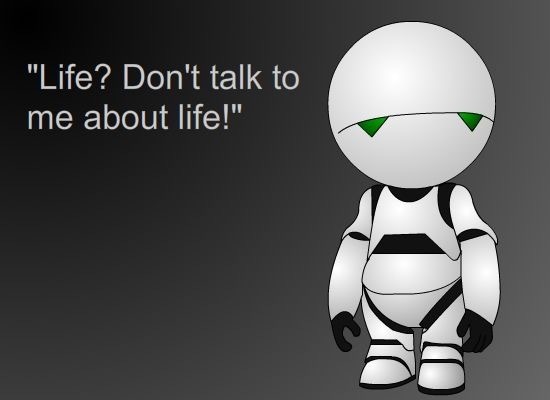 Good review, I like Marvin as well – “Life, don’t talk to me about life”! Can I also recommend the original BBC radio series if you can find it? It’s a bit more disjointed than the books and the movie, especially the latter parts, but a good listen nevertheless. Thank for the recommendation! I’ll have to check those out. Great to see this one covered. Solid classic. I think this was a series on BBC years ago. Really great stuff, very entertaining. I’d be interested in reading this book for sure! Hey – thanks loads for stopping by my blog. I’m enjoying yours! I listened to this book series on audio by the BBC. It’s so good, they’re definitely worth listening to in their own right. Try them if you can get hold of them. Definitely some of my favourite books!! If you liked this one, you should eventually try out “Starship Grifters” by Robert Kroese! Another humorous, amazing read!! Thanks for the recommendation! I’ll have to add that one to the list. I was just telling one of y friends about this book. We’re both vegetarians and every time I eat out I imagine a cow rolling its eyes at me. This whole book series was what allowed me to survive my high school civics classes. It’s a measure of how entertaining they are that I made it through in one piece. It’s a measure of how insipid the classes were that I didn’t flunk, despite not paying attention.